Do you live in Bloomingdale, FL? Are you tried of half-baked garage door specialists ripping you off? Are you fed up with having to book an appointment and have nobody show up? Your worrying days are over because BP Garage Doors is available to sort out all your issues. We understand that the garage door is the largest piece of equipment in your home and should only be left in the care of people who know exactly what they are doing. 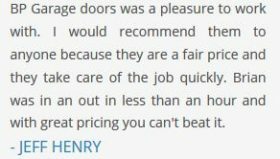 We have been in the garage door business for more than 20 years and know what it takes to keep our clients happy. Moreover, garage door burglaries have increased to 33% in the U.S. and studies show that it takes less than 10 seconds for thieves to break into the average garage door. Needless to say, that a demand for reliable garage door contractors has risen. This is the reason why we have chosen to expand operations into the Bloomingdale area to ensure the safety of lives and property. Our technicians are professionally trained and field tested before we send them to you. They have all passed background checks and are drug-free. They are certified by the International Door Association. So be rest assured that you are receiving the best of advice and service. Integrity and competence are hallmarks of our business and we are proud to be part of the Bloomingdale community. We are committed to providing quality services at the best prices. 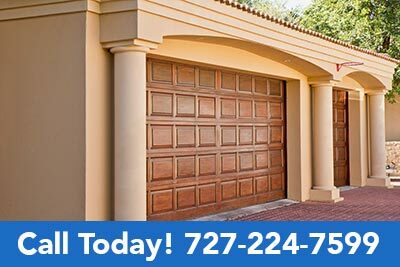 We are available in Bloomingdale to help with all your garage door installation, repair and service needs. We repair extension springs, rollers, cables, section replacements and off track doors. We also repair keypads, safety sensors, garage door openers, remotes, and much more. We provide a written estimate before we carry out any work, fully explaining what we are going to do in plain English, so that you understand it. We run all completed projects through our 25 point safety inspection so that you are confident that your door has been fixed right. We offer same day service for emergencies and weekend appointments. Our trucks are fully stocked to ensure that we can complete the job with one visit. We offer a 24 hour call back policy because we appreciate your business and are willing to work hard to keep it. Most of our jobs come from previous customers and referrals. This is a pointer to BP Garage Door’s focus on great customer service. We pride ourselves for our customer-focused approach towards all residents in Bloomingdale, FL. Our sales and office staff are available to answer all your questions, show you pictures, and explain the unique add-ons we can provide for your garage. We work closely with you to make sure that you get exactly what you want while keeping your budget in mind. 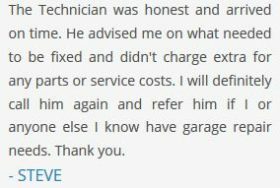 There is no point having a great garage door service, if we are never there when customers need our services. Our phones are on 24 hours a day, 7 days a week. We are always primed and ready to go to work. We are large enough to handle anything you throw at us and small enough to give you the one-customer treatment. Give us a call today at 727-224-7599.